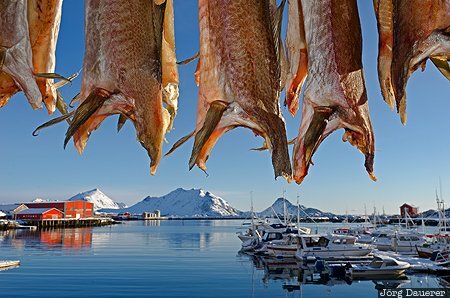 Stockfish (Norwegian: Tørrfisk) is unsalted fish dried by cold air and wind. It is seen in the harbor of Ballstad back-lit by warm morning light and partially illuminated by a flash gun (used as a fill flash) in front of the snow covered harbor and the landscape of the island Vestvågøy. Ballstad is in the south of Vestvågøy, an island of the Lofoten archipelago in Nordland, Norway. This photo was taken in the morning of a sunny day in March of 2013. This photo is part of the exhibition Fill Flash (June 2016). This photo is in the Photo Calendar "Norwegen". This photo was taken with a digital camera.